Incorporated in 1924, Fair Lawn borough was named after the David Acker estate home that later became the Fair Lawn municipal building. Located in bustling Bergen County, New Jersey, Fair Lawn has shown continued growth over the years. Living up to its motto of “A great place to visit and a better place to live”, Fair Lawn was named one of the Top 10 Best Places to Live in New Jersey. A large percentage of the borough’s population is made up of working professionals that commute to nearby New York City and, with its convenient location, Fair Lawn is an ideal place to call home! Since the 1940's, Booth Movers has been providing quality moving and storage solutions throughout Fair Lawn and the Bergen County area. Known for our exceptional customer service, our Fair Lawn movers are committed to making your relocation a seamless experience from start to finish. Whether you are moving down the street or to the other side of the country, our Fair Lawn moving company has the equipment and resources to take the stress out of your transition. As an agent for Atlas Van Lines and member of several reputable industry organizations, our Fair Lawn movers have access to a vast network of diverse equipment and global resources. 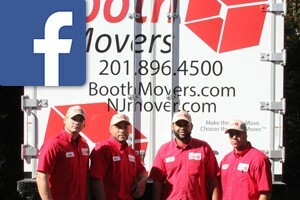 Booth Mover’s Fair Lawn moving services can be customized to suit the unique needs of your family’s relocation. For more information, see the links below! Residential Moving – For residential moves big or small, all of our customers can expect the same level of exceptional customer service from Booth Movers! Household Moving – Make your household move a breeze by letting our Fair Lawn moving company help you plan out your relocation. Local Moving – If your next move is keeping you in the Bergen County area, you can trust our knowledgeable Fair Lawn movers to handle all the details. Long-Distance Moving – Take the stress out of moving a long-distance by using Booth Movers for all of your relocation needs! Interstate Moving – Moving to another state doesn’t need to be an overwhelming process when you have our Fair Lawn moving company on your side! Full-Service Moving – From specialty moves to whole-house packing, our Fair Lawn movers do it all! International Moving – Booth Movers has many years of experience making international moving a seamless, stress-free process. Interested in learning more about what makes our Fair Lawn moving company stand out? Give us a call today or fill out our online form to request your free moving estimate!